It’s time to explore the great outdoors! 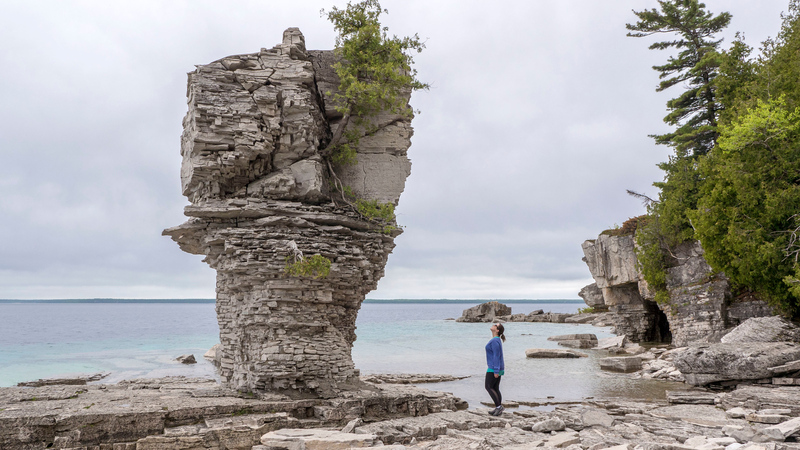 The Bruce Peninsula in southern Ontario is known for its epic natural wonders, including caves, grottos, and unique rock formations. Thankfully, these are all easily accessible through wooded trails through the forest. 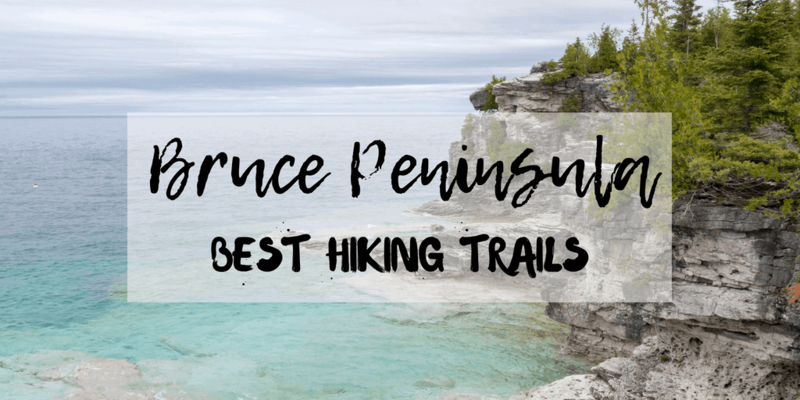 There are several Bruce Peninsula hiking trails to discover, and I’ll detail a few of my favourites. 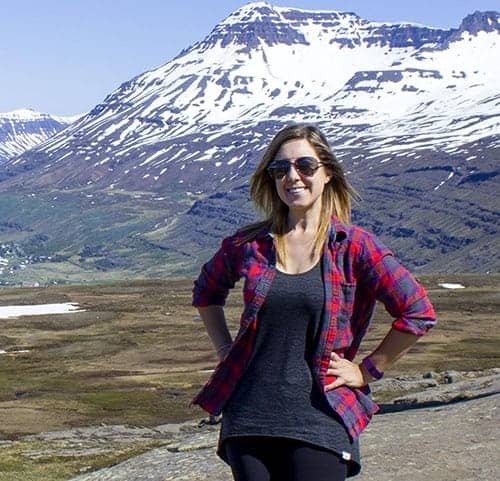 While I’m all for embarking on lengthy hiking adventures, sometimes the best trails for day trips are ones that are easy to navigate and have incredible scenery along the way. These hiking trails are not strenuous by any means, and they all only take an hour or two to explore at most. 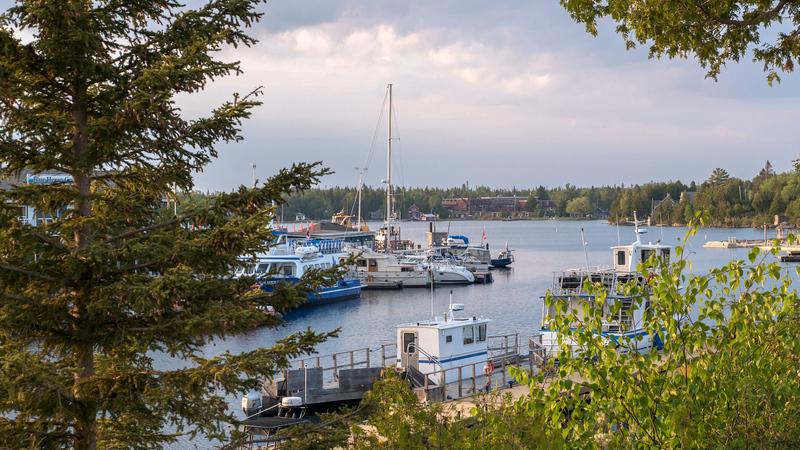 If you’re travelling to Tobermory, Ontario, the trip isn’t complete without a visit to the Bruce Peninsula National Park. Two points of interest that you need to check out are Indian Head Cove and the Grotto. Hike along the Georgian Bay Trail to get to these two spots. 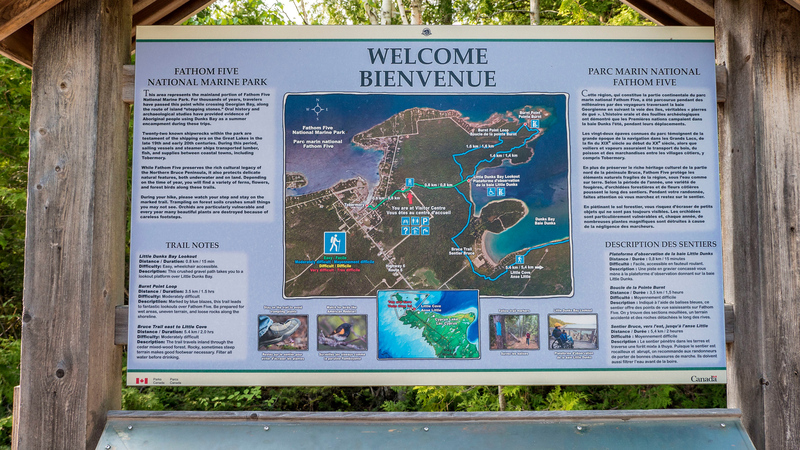 The Georgian Bay Trail is a direct trail from the P1 parking lot at Cyprus Lake to the Grotto. It will take about 30 minutes to hike out to Indian Head Cove, the natural arch, and the Grotto. The trail itself is relatively flat and easy to hike. Along the way, check out views of Cyprus Lake and enjoy a peaceful walk through the forest. 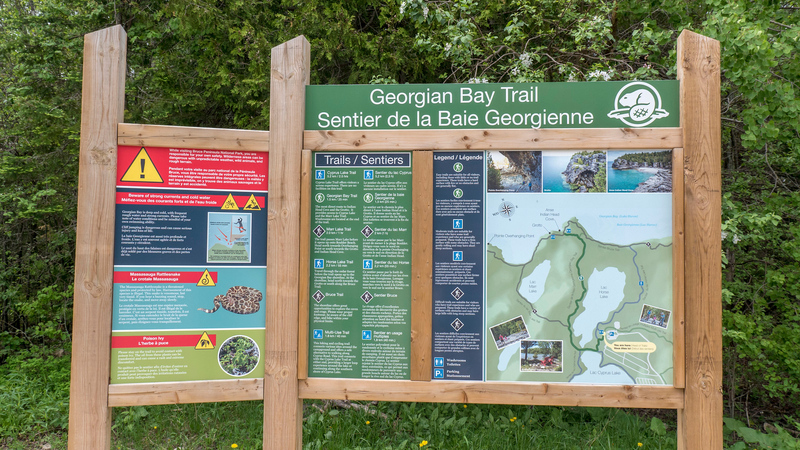 Within no time, the Georgian Bay Trail will lead you directly to the shoreline of Georgian Bay. From there, soak up spectacular views of the turquoise waters, the rugged cliffs, and the intriguing rock formations. You can walk down to Indian Head Cove on massive, flat rocks to get right up to the water’s edge. It was far too cold to go swimming in late May when we visited, but this is a popular place to take the plunge. 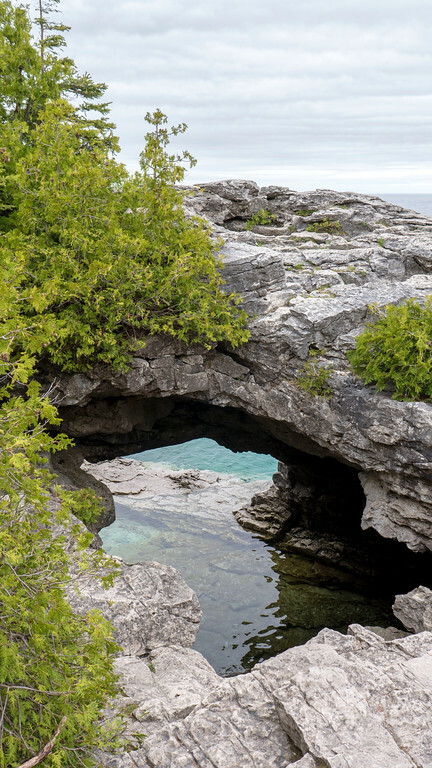 If you head back to the trail, hike along a small stretch of the Bruce Trail to view the natural arch and the Grotto. We admired the natural arch and the blue waters inside the cave. Again, it was too cold for swimming, but you can continue to hike down the cliffs and into the Grotto on a hot, summer day. From there, we hiked back to the parking lot on the Georgian Bay Trail. 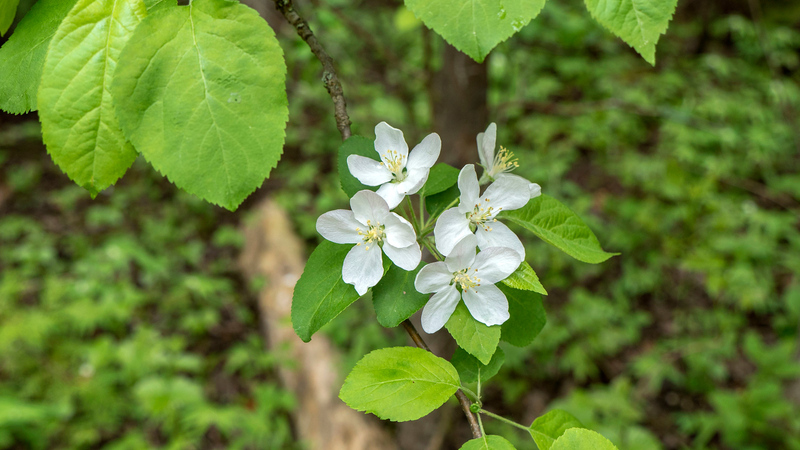 There’s also the option to continue along the Bruce Trail to Boulder Beach, loop back around on the Marr Lake Trail, and connect back with the Georgian Bay Trail. 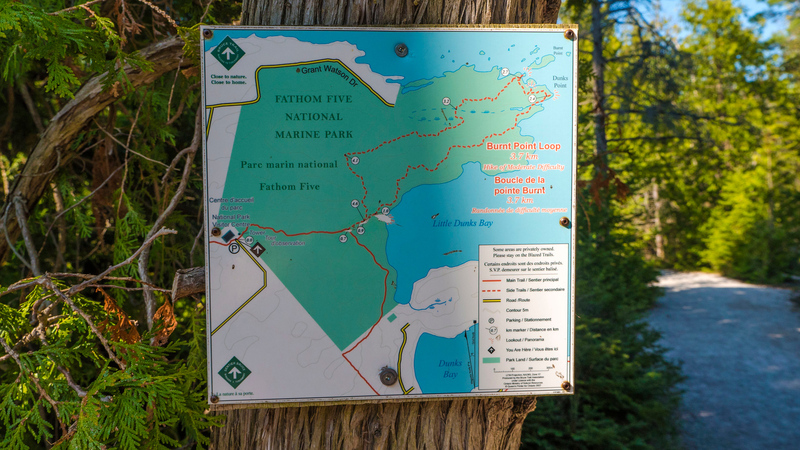 Other hiking trail options in the area are the Cyprus Lake Trail (5km easy hike) and the Horse Lake Trail. No matter which Bruce Peninsula hiking trails you choose, you’re bound to have an epic and memorable adventure. I mentioned the Bruce Trail briefly because it weaves through the Bruce Peninsula National Park. I’ve made numerous mentions throughout the blog about the Bruce Trail because my goal is to slowly hike the entire thing. 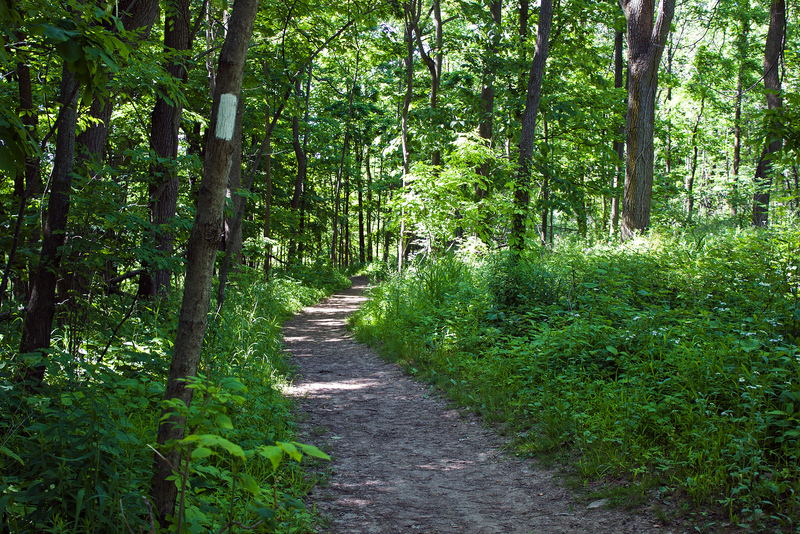 The Bruce Trail is a 900km hiking trail throughout southern Ontario, from Niagara to Tobermory. You’ll always know when you end up on the Bruce Trail because you’ll see the white blazes on the trees. While we didn’t hike much of the Bruce on our trip to Tobermory, we saw the northern terminus of the trail at Little Tub Harbour in Tobermory. I know I’ll eventually be hiking sections of the trail up here when towards the end of my hiking journey, so please stay tuned for that! 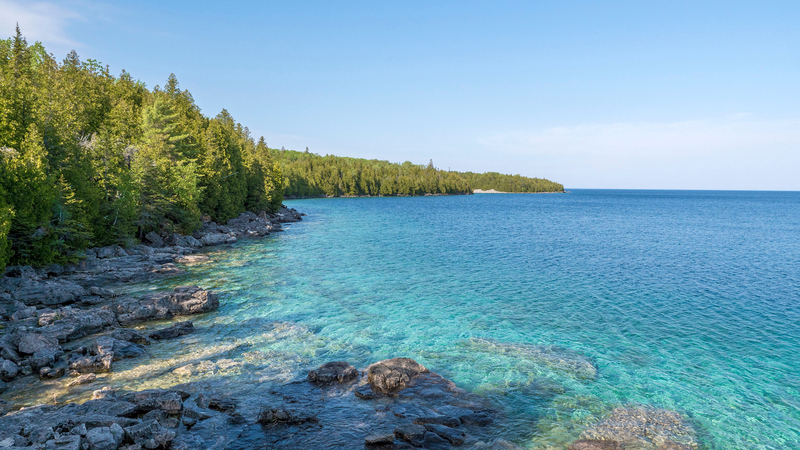 Closer to Tobermory, head to a section of the Fathom Five National Marine Park near the edge of the peninsula. 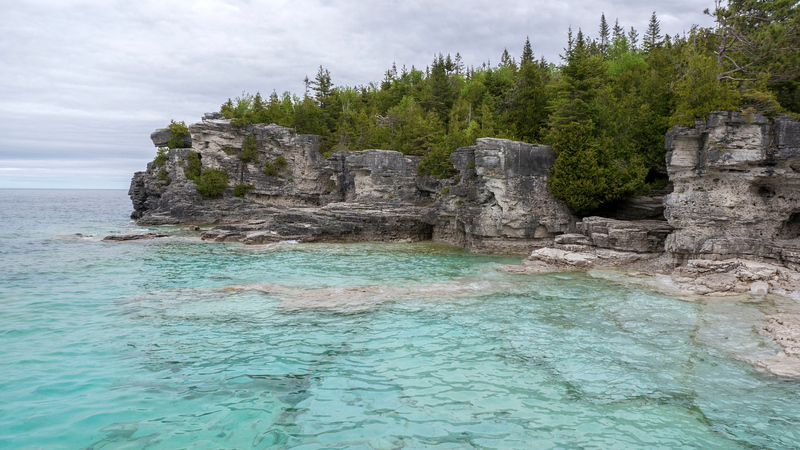 We discovered this area of Bruce Peninsula hiking trails completely by accident. Justin and I thought we were approaching the Bruce Peninsula National Park, but accidentally drove past it and wound up here. Well, it was a happy mistake as we found a few gorgeous scenic lookout points that are not to be missed. First, visit the lookout tower near the Parks Canada building for an astonishing panoramic view of the surrounding area. 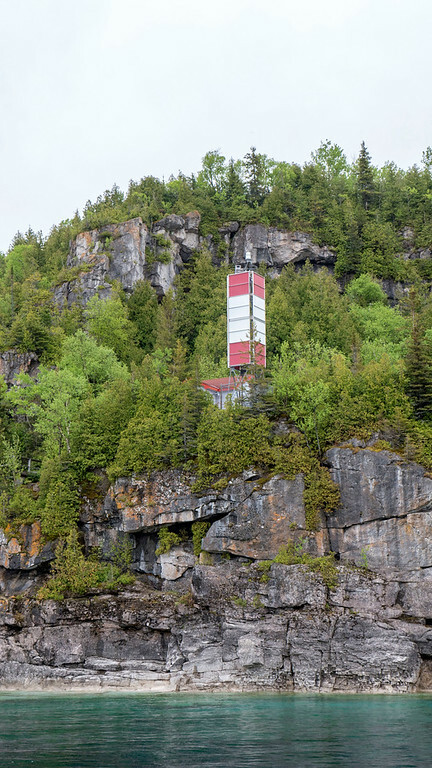 Trek up to the top of this metal tower to admire scenery of Georgian Bay and beyond. It gets a little windy up there, so hold on to your hats and maps! Next, hike the Main Trail to the Little Dunks Lookout. This also happens to be a part of the Bruce Trail. It’s less than a kilometre to the lookout, and it’s a very easy and flat hike. When you get to the end of the trail, you’ll see an opening between the trees with a small deck. 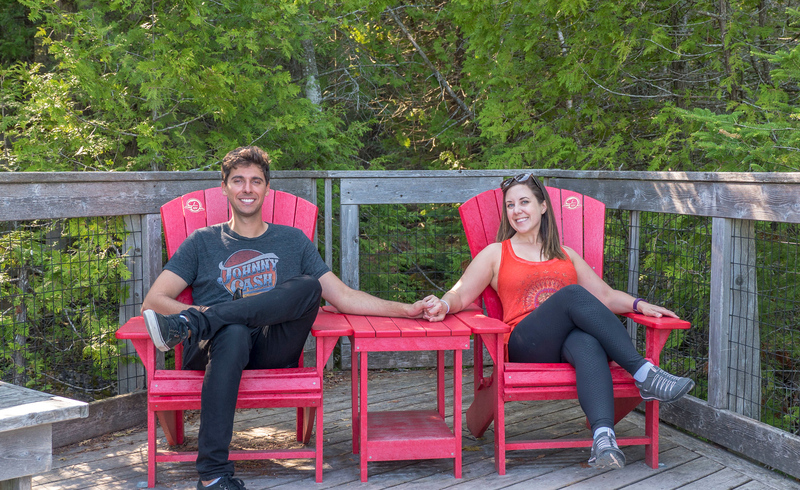 There are red Muskoka chairs waiting for you to sit, relax, and savour the views. The turquoise water at Little Dunks Bay looks straight out of the Caribbean. 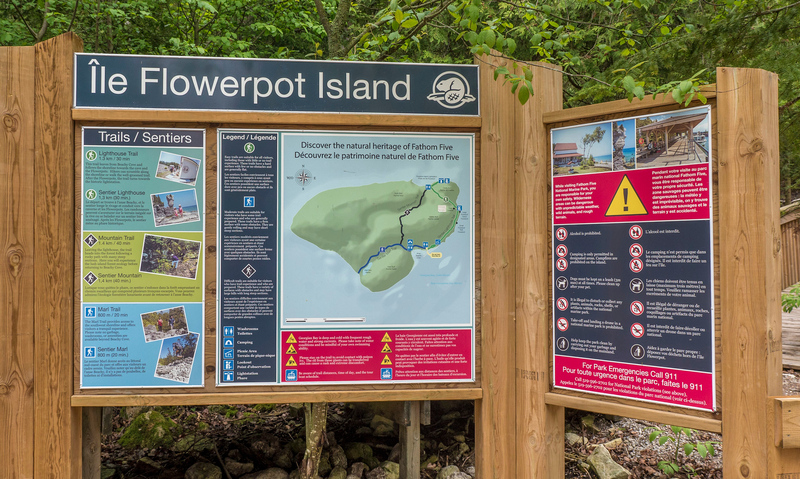 My favourite Bruce Peninsula hiking trails are at Flowerpot Island. This little island has got it all: one of a kind rock formations that look like flowerpots, hiking trails, a lighthouse, beautiful turquoise waters, and it’s fairly remote. You must book a boat tour with one of the companies in Tobermory to access the island, so there aren’t as many people there as you’re hiking around. We embarked on an adventure along the most popular trail, the Lighthouse Trail. From the docks, hike along the shoreline to see both flowerpot rock formations, and eventually reach the lighthouse and old lighthouse keeper’s home. The Lighthouse Trail is 1.3km and takes about 30 minutes to hike, although it will take longer if you stop to admire the sights on the way. There are two other trails on the island. From the Lighthouse Trail, you can take the Mountain Trail back towards the dock. The Marl Trail heads in an opposite direction from the dock to the southern end of Flowerpot Island. We stayed at the Bruce Anchor Motel, a clean and comfortable motel right in the middle of Tobermory. Centrally located, we walked right across the street to take our boat tour to Flowerpot Island. You can also walk into town within moments for meals or even to start your Bruce Trail hike. 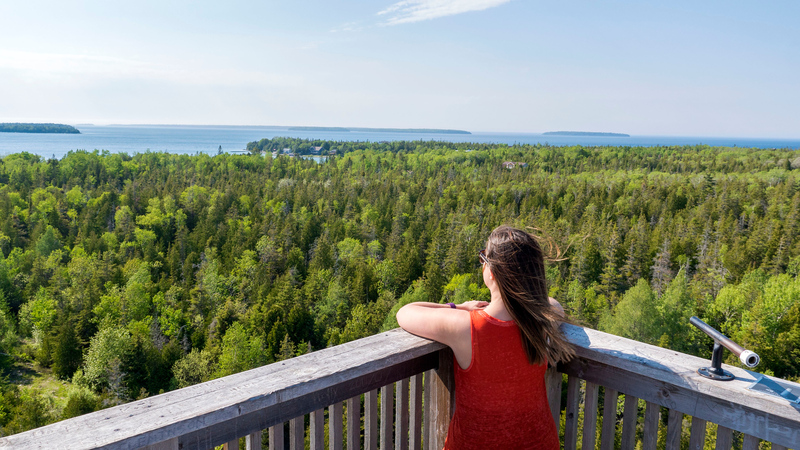 To access Little Dunks Lookout or the Bruce Peninsula National Park, it’s only a short drive away. 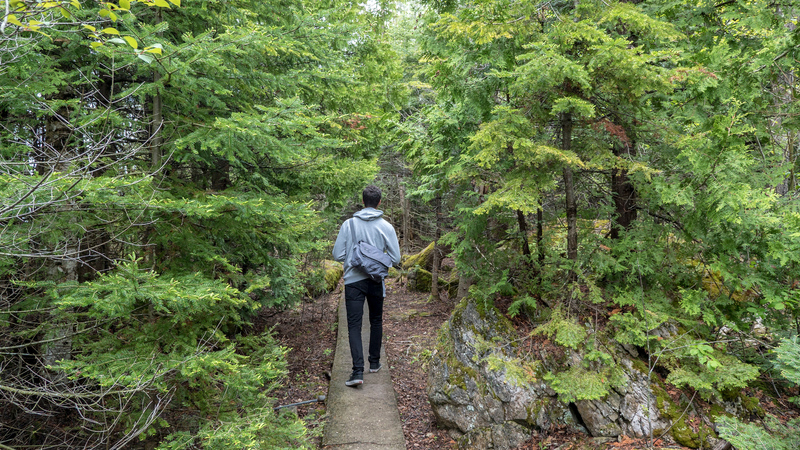 These are the best Bruce Peninsula hiking trails to start your journey. I’d love to return to check out the trails and paths at Lion’s Head. Next time! 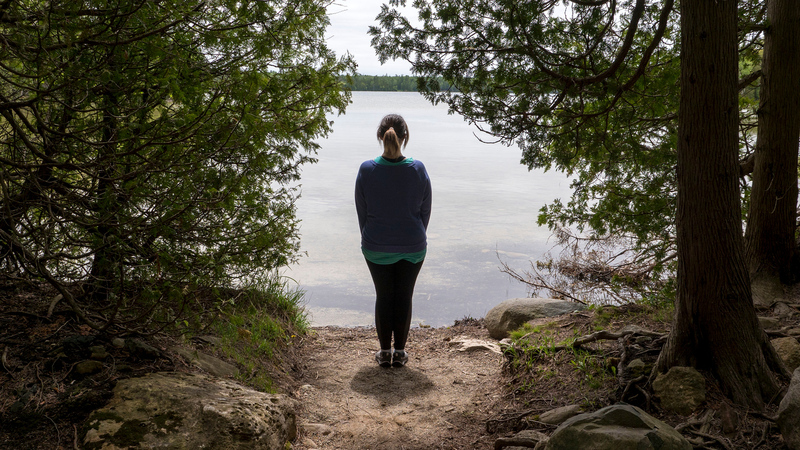 If you love hiking or exploring the great outdoors, head to the Bruce Peninsula on a day trip or weekend trip in southern Ontario. 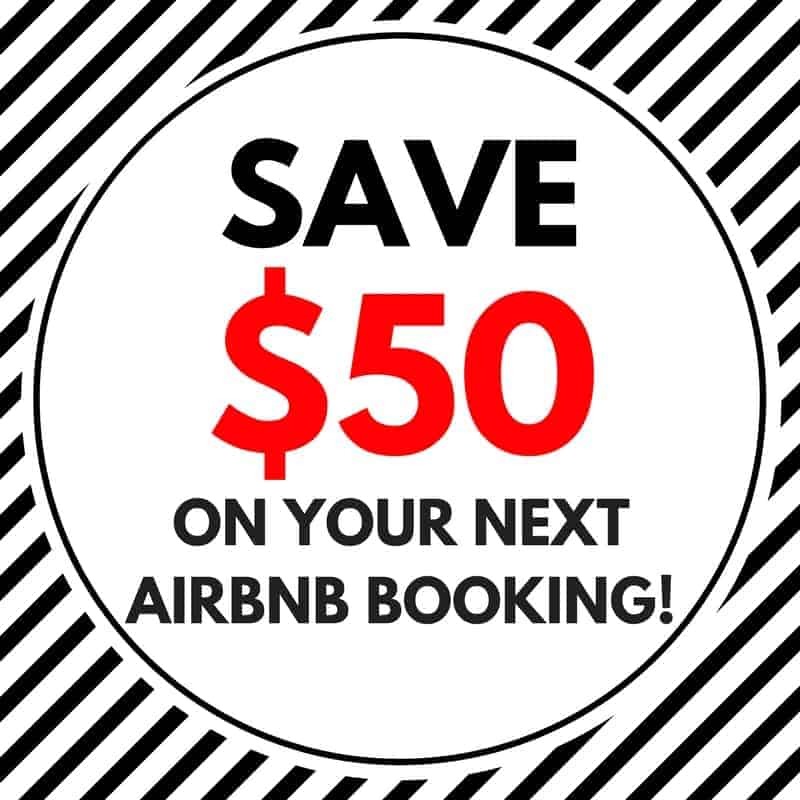 It’s the perfect vacation for those living in Toronto and beyond. 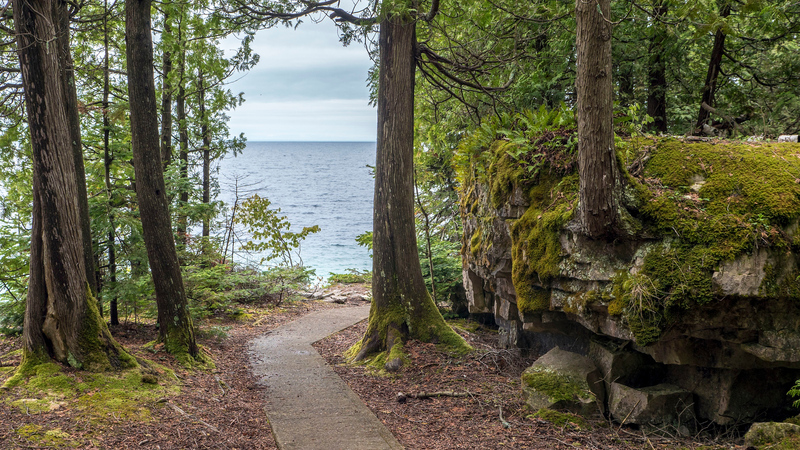 Have you hiked any sections of the Bruce Trail or the Bruce Peninsula? Going to be awsome ….we are going too Bruse Penninsula..diving , hiking and kayaking..and great food !! !